Update: Up to 134 people were arrested at the White House fence. 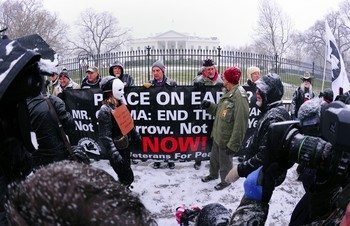 Hoping to spark the country’s silent majority into action, 131 antiwar protesters got themselves arrested Thursday, in one of the larger acts of civil disobedience in front of the White House in some time. 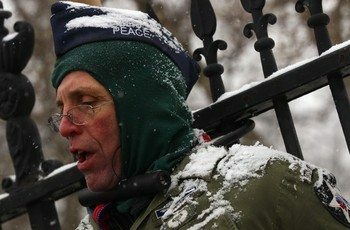 Today in the midst of a snow storm, dozens of Veterans for Peace and their supporters gathered against the White House fence in acts of civil disobedience to protest the wars this country is fighting in Afghanistan, Iraq, and Pakistan. Daniel Ellsberg (R), former military analyst who released the 'Pentagon Papers' in 1971, is arrested during an anti-war protest in front of the White House December 16, 2010. Dozens of protesters broke through a police barricade and lined up at the White House fence. Some chained themselves to it, while others chanted “Peace Now!” and sang anti-war and civil resistance songs. Elliot Adams chains himself to the fence in front of the White House with a bike lock . The Veterans for Peace has asked President Obama for a meeting to express to him their concerns three weeks ago, but have not had a response. Zach Choate, an Army veteran from the war in Iraq, participates in an anti-war protest in front of the White House. This is all breaking news, so check out this video taken during the early moments of today’s protest. Friends on the scene there report 124 people arrested. This is the most arrests in a very long time. For a president to refuse to even acknowledge their request for some sort of dialogue is pathetic. These people are speaking for millions of Americans who are fed up with this war, I mean these wars. I know sometimes we have to defend ourselves, and maybe our friends too, but we’ve been over there way too long. Everyone I know from both sides of the isle are saying we need to leave. Before there was wikileaks, there was Daniel Ellsberg…. Veritas odit moras- Truth hates delay. I just keep waiting for Obama to acknowledge that we “progressives” exist. Man, could he ever get our attention if he invited Daniel Ellsberg to the White House to simply talk about what he did back in the 70’s and relate it to today’s wars. Wars. Isn’t that horrible: war mentioned in its plural form. No kidding. But we’re all “f&%#ing retarded” at least according to Obama’s Chief of Staff. It’s worth noting that the protesters aren’t “just a bunch of dirty hippies “( think 1968). We were certainly vilified back then for our activism against Viet Nam. But here you have individuals who have served in the armed forces and they are being marginalized and arrested. What’s with that? Private military contractors have received more respect, attention and public support (through our taxes) than these men and women who have served in the military. That should tell us something. I think back then both sides were vilified. Protesters were vilified by the pro war side and returning vets were vilified by both sides or that’s how history seems to portray it. Goatskull – from my experience in the anti-Viet Nam movement, (1968-1974) returning vets were not vilified by the protesters at all. They were ignored by the government and media. It was too embarrassing for the Establishment to admit we had lost or were losing the war. The returning vets were an ugly reminder to them. So, the mainstream culture couldn’t handle them. Of course now, one-quarter of the homeless are vets. In fact, one of the high (no pun intended) points of my experience back then was the anti-war march that we all organized in Oceanside in the Fall of 1969 – led by two hundred sailors, marines and other active-duty military and people recently out. There were groups like VVAW (Vietnam Veterans Against War) and MDM (Movement for a Democratic Military) in Southern California and San Diego. Anti-war folks also did all kinds of military counseling … and consoling. So, it comes down to this myth perpetrated by the corporate media that returning Vietnam era vets were vilified and even “spat on”. The spitting allegations have never been confirmed, but keep getting perpetuated through time, so now everyone thinks it really did happen. Well I certanly don’t dispute you about the spitting thing. I remember that very discussion on tthis very blog almost a year ago. My uneducated guess is that just maybe there was one or possibly twu very small and very isolated cases and years later it got blown up into the big urban myth that it is today. Vets I’ve talked though do claim not to have exactly been given the red carpet treatment from either side. Perhaps thing were different from different parts of the country? You could be right. I don’t think we even had a “red carpet” to roll out. Of course we had other things to roll and often the returning VN vets had something to add. Oh and returning vets who became war protesters were vilified by pro war fellow vets. Sadly, that still goes on. Thanks to Barbara for alerting us to this action in Washington. How well I remember a report she broadcast to Stacy Taylor at KLSD while she was being arrested at another action. It was live from a phone in her “other pocket”, her bra. That made her my “she-ro”. Marilyn, Barbara does get around – she joined us almost a year ago down at the harbor singing against the Tea party. She’s also a member of the Billionaires for Wealthcare. The UCMJ is a corrupt good old boys network sending the youngest less ranking troops to PRISON for killing enemies and letting the CO’s off without a hitch! A 10 year war cannot possibly be “a war” in the true sense! Pakistan is harboring our enemies so why the hell are we in Afghanistan? STOP THE MEDIA LIES AND DISTORTION!! I agree with the veterans,and all Americans and people who love peace,I hate the wars and I say bring the troops home,The white house needs to listen to Americans,I’m concern about the state of this Country,I feel that the real issues should be addressed,and that’s the economy,health,education,infrastructure,we don;t need to waste money on a war that is based on a lie in the first place,so I stand with fellow Americans and people’s of the world who wants peace,that’s CHANGE I relate to. It’s time for thousands (or hopefully millions) of us to get out in the streets and protest. We can’t let the government think that it’s just a few hundred that are against these hideous wars–there’s millions of us and we need to be counted! In San Diego, we marched and protested and carried signs and stood on the roadsides, had “bannerdrops” on the overpasses and struck crosses in the lawn at Balboa Park to symbolize Arlington Cemetery. Didja notice? We marched in downtown San Diego twice with a very big crowd of loud protestors. Were you there? We went to Coronado to protest when Bush stayed at the Hotel del the weekend before Katrina hit New Orleans. Didja notice? Point is: We can hope for spontaneous demonstrations, but they need more organizing than you’d think. Yes, Marilyn, I was there, and I was at dozens more demonstrations and vigils. They were organized very well by the Coalition of Peace and Justice. It’s time for all of us to get out and demonstrate against these hideous wars. We need our money and efforts for education, jobs, highways etc.—not for killing! Support our troops–bring them home!. What a sad sick joke. Please note how little coverage this will get in major world media. Americans are so lazy and uninformed because of the marriage of corporate media to the Military Industrial Complex, it can only muster these small protests. War protest since the start of the Cheney/Rummy/Blair illegal Afghan and Iraq CRUSADES are getting less coverage than the Fred Phelps “GOD HATES FAGS” gang. Protest against the Vietnam illegal war for the MIC caused the super rich behind it to finally shut it down. These brave X soldiers are just SSATT as the FAKE war on terror rolls on. Are You a TWIC—Work Card Security Risk? 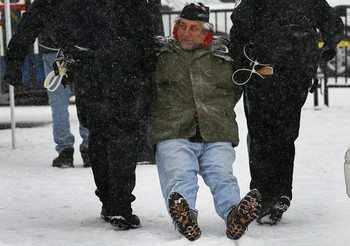 Recently 131 Veterans For Peace Demonstrators were Arrested In Front of White House. 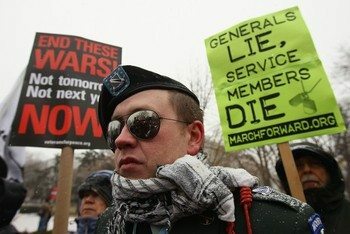 Veterans For Peace Demonstrations and Civil Disobedience have brought attention to America’s ongoing costly wars. Should Americans be concerned that Citizens may subsequently be afraid to participate in lawful demonstrations against U.S. Government after Homeland Security issues millions of TWIC “right to work Cards” for private sector jobs; that Homeland Security may (disqualify) Veterans For Peace and other Civil Demonstrators—being issued TWIC Work Cards on the basis they are a “Security Risk?” Such concerns by working people could silence, intimidate Americans speaking out against Government. The TWIC government website for issuing Work Cards states, that job applicants deemed a “Security Risk” (convicted of specified crimes listed by HLS), will not be issued a TWIC Card to work at certain private sector jobs/and current employees denied TWIC Cards can be fired. The TWIC site further states, HLS will inform rejected job applicants and fired employees the reason Homeland Security would not issue them a TWIC work Card; rejected job applicants and fired employees may appeal. But realistically does HLS have to respond or fully provide a job applicant or fired employee the reason they were denied a TWIC Work Card? HLS can refuse to respond or not fully on the basis that doing so could threaten National Security or compromise an ongoing investigation. Other countries to protect national security, to safeguard ports, trains and airways, have created agencies similar to TWIC, but moved forward to crush civil liberties. In the beginning e.g. the German Reich Government without public oversight, barred Germans holding certain private sector jobs that were threats to national Security, but soon prevented lawful Germans getting work because they spoke out or protested against the Nazi government. Could TWIC be similarly abused? Consider that TSA has put a large number of lawful Americans on “No Fly Lists.” Many that made requests to government to learn why they are on the “No Fly List”, were not provided an explanation by HLS/TSA. TSA is now in the process of labeling lawful Americans as “Extremists” that publicly oppose TSA mandated X-ray scans and invasive body-pat-downs at airports. So is it problematic Americans denied TWIC work cards might be treated similarly when requesting to know why they were denied a work card? Who is a security risk? Currently HLS utilizes over 90 national FUSION CENTERS that obtain and store information on ordinary Americans. Fusion Centers nationally share information with law enforcement agencies that among other sources receive information from informants. Could erroneous information provided by snitches to local police/HLS be used by HLS not to issue a TWIC work card to Citizens never charged or convicted of a crime? Under such circumstances how would Americans denied the right to work rebuke the allegations of an informant?